For many years, desensitization and/or tolerance induction to allergens via allergen-specific immunotherapy (AIT) has been the focus of research. AIT using the subcutaneous, oral, or sublingual route provided encouraging results in food allergy, despite serious and significant safety concerns [2–8]. Two small studies in peanut allergic patients showed that subcutaneous immunotherapy (SCIT) was associated with reduced symptoms [9, 10]. However, a high rate of serious systemic reactions (13%) made this treatment unsafe for routine use. Because of these limitations, although effective, it is currently not recommended to use immunotherapy for peanut allergy for routine clinical use [11–13]. Combining AIT with a nutritional intervention may provide a new window of opportunity to improve the efficacy and safety of AIT for food allergic patients. 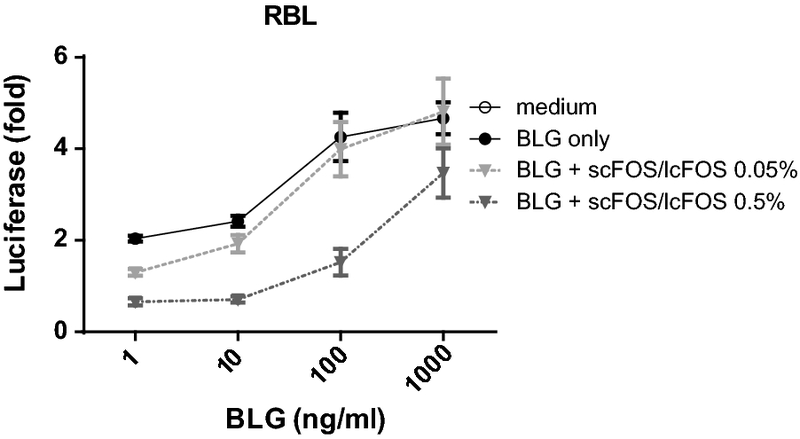 The combination of SCIT or sublingual immunotherapy for allergic rhinitis or asthma with bacterial products or Toll-like receptor ligands has demonstrated enhanced and persistent beneficial effects in both animals [14–16] and patients [17, 18]. However, human data concerning the additive effect of supplementation with immunomodulatory food components on the safety and efficacy of OIT for food allergy is limited. In peanut allergic patients, combining OIT with a probiotic strain resulted in a long-lasting clinical benefit [19, 20]. Besides probiotics, prebiotic components like dietary non-digestible oligosaccharides, derived from vegetable or dairy sources, also support growth of beneficial bacteria in the gut . These oligosaccharides, like short- and long-chain fructo-oligosaccharides (scFOS/lcFOS), were able to effectively prevent the onset of allergy, and prevent allergic manifestations in different mouse models [22–24]. Moreover, in whey-sensitized mice a diet supplemented with scFOS/lcFOS showed improved efficacy of OIT . 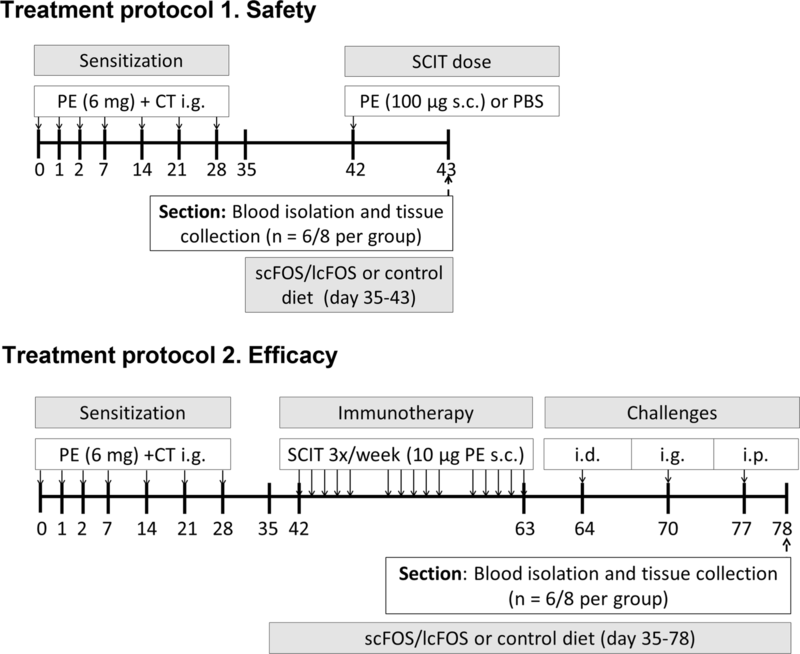 Therefore, non-digestible oligosaccharides administered after sensitization but before SCIT, might provide a better safety profile during treatment and therefore might improve the efficacy of therapy. To reduce side-effects while maintaining efficacy of AIT for food allergy, several new treatment concepts have been investigated, as reviewed in [31–34]. The combination of AIT with nutritional interventions may provide a new possibility to enhance the safety and efficacy of AIT due to a reduction in side-effects during dose increasing protocols. Our results indicate that supplementation of the diet with scFOS/lcFOS reduced the side effects caused by a single PE SCIT dose. This effect appears to be due to a direct effect on mast cells, since scFOS/lcFOS reduced mucosal mast cell degranulation in vivo and inhibited degranulation of RBL cells in vitro. These results support the concept that nutritional interventions have the potential to improve safety of SCIT. We and others hypothesized that the combination of AIT with immunomodulatory components, which addresses both specific and unspecific (e.g. 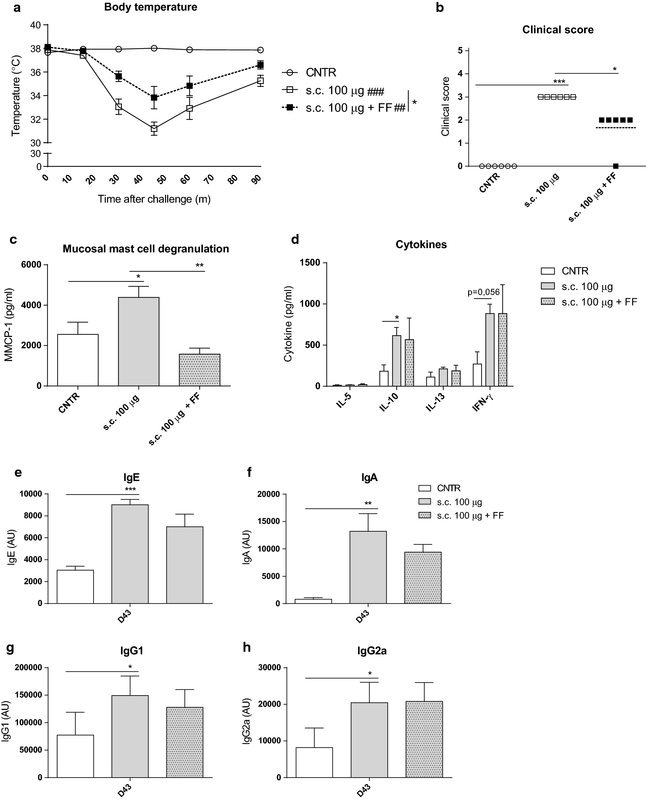 linked to innate effector cells such as mast cells) modulation of the immune response respectively, could be a promising strategy to improve efficacy and safety of AIT. Recently, we have shown that oligosaccharides are capable of improving the efficacy of OIT , and here we show that these substances also improve safety of SCIT. Previously it was shown that combining subcutaneous or sublingual immunotherapy with bacterial adjuvants or Toll-like receptor ligands could enhance tolerogenicity in allergic rhinitis [14–16, 51, 52], a strategy which is already successfully translated to humans [18, 53–55]. In peanut allergic children, OIT administration was combined with the probiotic Lactobacillus rhamnosus . The authors report a long-lasting clinical benefit and persistent sustained unresponsiveness to peanut after 4 years without treatment . Although no control (only OIT) was included, the proportion of children experiencing adverse events was lower compared to other trials where only OIT was used [19, 56, 57]. This study suggests that the combination of OIT and probiotics may lower the incidence of adverse events making this treatment clinically feasible.